We are travelling from Montana to Wisconsin at the present. I need to drop Dennis off at the Minneapolis Airport first and then it's off the Phillips for the Ruffed Grouse opener! I enjoy walking those trails probably more than any other form of bird hunting. I've often said if forced to hunt only one bird- it would be Ruffed Grouse! 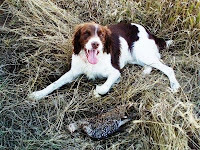 That is a true gamebird- hard to find and impossible to shoot. I'm sure that there are many who would say they have no problem getting a 5 bird limit everytime they go out. I do- and I'm not ashamed to say it. I limited last year in September and took a self portrait- its my screensaver. I love to look at it and remember the dog work, the shooting and the day. That's Ace (stinky, I call him now) above with one of his Sharpies in Montana. Good year up there, by the way. Not like last year, but when is it ever- right?